9591 Iris had a crowded calendar this weekend, what with the usual errands, an urgent need to do time at the gym (made more so because of satisfying a huge craving for beer and a burger), and then serious prep for the coming ice storm (now in shivery, creepy progress). But near the top of the list was a visit to see the above, the Oscar Mayer Wienermobile. When the Wienermobile comes to your town, you should take time to go see it, because Wienermobile. There have been many models of Wienermobile over the years, roaming these United States to advertise hot dogs and appeal to the American delight in whimsy. We drove out to an unfamiliar and far-away neighborhood see it even though its Saturday appearance was at It Which Shall Not Be Named, the megastore we never enter because its business model is just plain evil. But, the Wienermobile. One of the nice things about this adventure was seeing the way it made people happy. Everyone who looked at it smiled, and many people walked past it into the store, then turned right around and came out, smiling even more, to take a picture. It just speaks to everyone, and not in an ironic or snarky way. 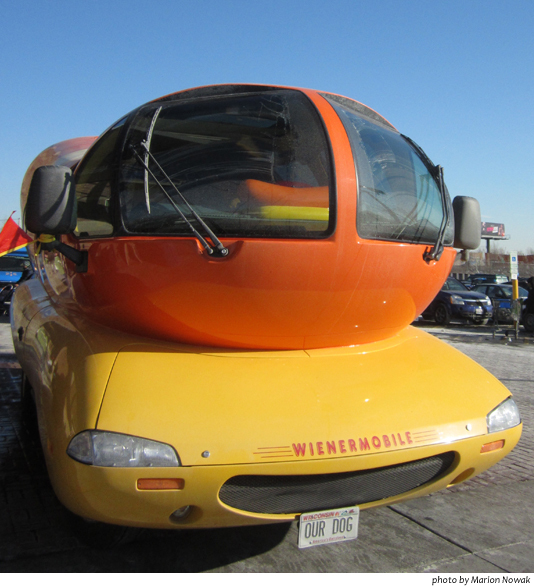 Whatever you, or I, think about factory farming or nitrates or It Which Shall Not Be Named, the Wienermobile is still an ambassador from a world where everyone is courteous, and respects each other, and enjoys the simple, honest pleasures. 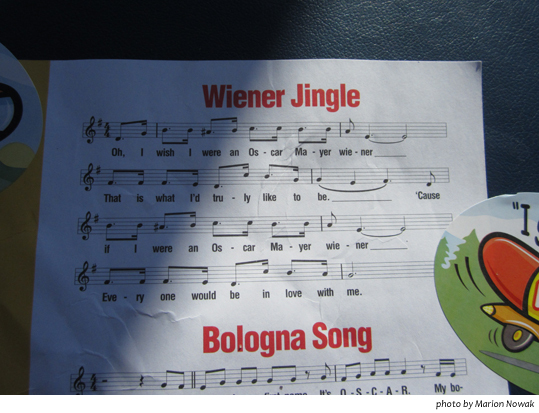 Here’s the jingle, by the way. This entry was posted in Uncategorized and tagged hot dog, It Which Shall Not Be Named, Wienermobile. Bookmark the permalink.